NEW! GREAT FOR HOURS OF IMAGINATIVE PLAY! FREE SHIP! At four and a half feet tall, the Majestic Mansion Dollhouse from KidKraft is spacious enough for even the biggest imaginations! With four levels and eight rooms to decorate and explore, your little one can have the whole neighborhood crew over to play together. The dollhouse has never been used However. the box is in poor condition. If you don't mind the poor box you will get a very good set. Model : 65079. Make : KidKraft. Personal Care. Includes 16 colorful pieces of furniture and also hanging chandelier. Can't find the answer you're looking for?. You can expect our service to be friendly and professional. Spark big, imaginative dreams with the sweet and classic KidKraft Charlotte Dollhouse with EZ Kraft Assembly. After this, the order might not be able to cancel. Product Features - For ages 3 and up. Up for sale is from 2009 "Toys R Us", "IMAGINARIUM GLITTER DREAM BARBIE DOLL SIZE DOLL HOUSE ". Four rooms to include a Living Room, Bedroom, Kitchen, and Terrace. NOT included, but fits up to 12" Barbie size dolls. Create more room for your child's imagination and play. Material: MDF, Wood. Perfect for dolls up to 12"/ (30cm) tall. Suggested Age: 3 Years and Up. Up for sale is from 2010, "Toys R Us" retired "IMAGINARIUM DELUXE PLAY AROUND BARBIE DOLL SIZE DOLL HOUSE ". It features an open design with 4 sliding outside walls, giving you total access from every angle. Part Number - 65054. Manufacturer - KidKraft. Children can enjoy hours of fun with the KidKraft Super Model Dollhouse. It features four detailed rooms, three floors, a patio and stands over four feet tall. It's designed for use with 12" dolls and for kids ages 3 years and up. KidKraft Shimmer Mansion With 30 Pieces Of Accessories! Girls Fantasy House New. 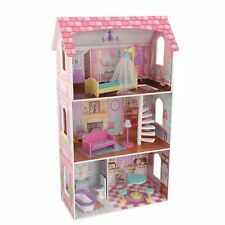 Brand new dollhouse fast and free shipping! KidKraft 65956 Charlotte Dollhouse with Ez Kraft Assembly Dollhouses, Multicolor. EZ Kraft assembly for rapid assembly. 7X23X35-37 zone 1. THIS ITEM IS NEW IN THE ORIGINAL BOX. Model: 65823. KidKraft My Dreamy Dollhouse With Furniture. Large enough that multiple children can play at once and piano plays music, toilet makes flushing sound, lamp lights up. 14 pieces of furniture, including a grand piano and a hanging plant. The bright, four-level dollhouse stands over five feet tall and is richly detailed with working lights and a flushing toilet. A modern staircase leads to the towering bedroom loft for a breathtaking view. KidKraft Wooden Dollhouse Shimmer Mansion for 12 Inch Dolls - Brand new. Condition is New. Shipped with USPS Priority Mail. 17 pieces of furniture. Large enough that multiple children can play at once. Windows that open and close. Finely detailed artwork; Materials: MDF, Wood, Fabric, Plastic. Three levels of open space. 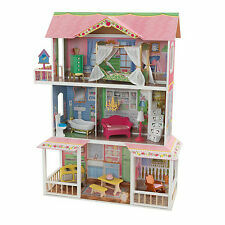 Brand new Kaylee dollhouse, fast and free shipping! (1) DOLLHOUSE. (10) PIECES OF FURNITURE AS FOLLOWS. ***Box opened *** but BRAND NEW!!! Never used. Give your little girl the toy of her dreams with the KidKraft Majestic Mansion Dollhouse with Furniture. size: Majestic Mansion Dollhouse. model: 65252. Is bigger always better?. Standing nearly four feet tall, the KidKraft Kids' Kayla Play Dollhouse is bigger and better. The dollhouse features 3 levels with 4 rooms and a patio. The playhouse is beautifully crafted of wood and covered in colorful, detailed artwork. Detailed fire escape and balcony. Room for 12' dolls to play. Magnetic dress form with outfits. Playing house has never been so fun. The included 14-piece accessory kit includes a grand piano that plays music and a toilet with flushing sounds. KidKraft My Dreamy Dollhouse with 14 accessories included. The bright and fun So Chic Dollhouse is KidKraft's most expansive dollhouse! Standing nearly four feet tall, it features three levels, 10 rooms and 360 degrees of imaginative fun! With no exterior walls, kids can access every room from any angle. A classic dollhouse with southern flair, the KidKraft Savannah Dollhouse stands over four feet tall and features four levels of imaginative fun with six rooms and two balconies. There are cozy decor touches throughout. We aim to show you accurate product information. COMMUNICATION IS KEY! Toys Dolls & Dollhouses Dollhouses & Play Sets. Large enough that multiple children can play at once. Three levels of open space. Considering the 35 accessory pieces that are included, this wooden dollhouse is one of the best bargains you'll find anywhere. Keyboard plays music at the push of a button. Lamp lights up at the push of a button. Is bigger always better?. Standing nearly four feet tall, the Kids' Kayla Play Dollhouse is bigger and better. The dollhouse features 3 levels with 4 rooms and a patio. The playhouse is beautifully crafted of wood and covered in colorful, detailed artwork. From the molded latticework to the chandelier hanging from the ceiling, this dollhouse is full of gorgeous details sure to put a smile on any young girl's face. 16 colorful pieces of furniture. Includes 16 colorful pieces of furniture and also hanging chandelier. Our KidKraft Uptown Dollhouse is big fun for modern imaginations. This uniquely modern design is laid out between two towers, each standing close to four feet tall. And with two outdoor areas - including a rooftop patio and an expandable backyard with a pool - there is plenty for kids to explore. KidKraft Girls Uptown Dollhouse Scale Kit with Furniture Play Toy New. Considering the 35 accessory pieces that are included, this wooden dollhouse is one of the best bargains you'll find anywhere. Smart, sturdy wood construction. KidKraft Large Wood Dollhouse w Furniture Kit Kids Doll House Girls Toy Gift New. Playing house has never been so fun. The included 14-piece accessory kit includes a grand piano that plays music and a toilet with flushing sounds. Create more room for your child's imagination and play. KidKraft Grand View Mansion Dollhouse with EZ Kraft Assembly and 34 Accessories. Four and a half feed tall and large enough for multiple children to play at once. Our Majestic Mansion is over 4 ft. wide and 4 1/2 ft. tall, giving young girls tons of space for taking care of their favorite dolls. This adorable dollhouse is full of fun, interactive features and would make a perfect gift for any occasion. If your little girl wants her dolls to truly live in style, this is the dollhouse for her. Accommodates 4 in. mini dolls. 3-levels of open space. Assembled Depth (in.). Large enough that multiple children can play at once. With 10 rooms, a porch, four levels and standing over four feet tall, this dollhouse is big enough to share. KidKraft Country Estate Dollhouse with 31 Accessories. KidKraft Country Estate Dollhouse. If your little girl wants her dolls to truly live in style, this is the dollhouse for her. Assembled Depth (in.). 3-levels of open space. Large enough that multiple children can play at once. Assembled Height (in.). It was built to last for many years and has colorful artwork on every wall of every room. Young kids just love sitting down in front of this house and playing pretend. Features include. We cannot make any change. 3 levels, 4 rooms and a balcony. Three stories and 13 colorful pieces of furniture. Detailed scrollwork. We stand behind our products. width: 0 x height: 0 x length: 0 x weight: 0. Our whimsically detailed KidKraft Florence Dollhouse features fun, vibrant colors, two balconies and four rooms and stands nearly four feet tall. 10 pieces of dollhouse furniture, including a hanging chandelier, canopy bed, grandfather clock, molded plastic staircase. Dare to dream big with our KidKraft 18" Dollhouse Doll Manor with 12 Accessories Included. Standing over 5' tall and 4' wide, it features four rooms and a balcony for kids to explore and two winding staircases and real wood features.